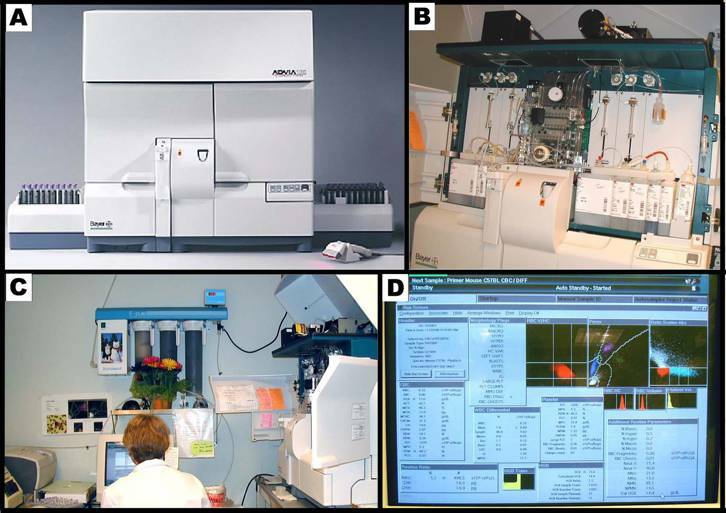 Purpose: To generate hematological phenotypic profile for C57BL/6J-Chr#A/NaJ consomic strains using the ADVIA 120 system. a. Blood is collected from non-fasted mice. b. Collection tubes (1.5 mL Eppendorf) are pre-loaded with 20µL of 20% EDTA. d. Blood collection tubes are filled to a final volume of 250µL and then kept at room temperature for the duration of the test. Purpose: To generate blood plasma chemistry profiles for C57BL/6J-Chr#A/NaJ consomic strains using the Beckman Coulter Synchron CX5. Notes on reagents: The Chemistry Analyzer (or "CX5") uses Beckman Coulter three-compartment reagent cartridges for HDL, CHOL, TG, and GLU. Each cartridge contains enough reagents for 300 tests (approximately 104 mL). In addition, in order to run the HDL Cholesterol test, HDL Cholesterol Separation Reagent (15 µL per sample) is needed. The bottle from Beckman Coulter contains a volume of 34 mL. If the dilution of plasma samples becomes necessary due to low plasma volume, use 0.9% saline solution for the dilution. • Function key F2 is used to deploy "Program Batch/Sector(s)" and "sector(s) to program:" (i.e. sectors 1-5 is programmed). When "Batch mode activated, 7 cups possible. "Number of cups in batch:" message is displayed, the total cups for this batch is then (7 x 5) = 35 cups (the maximum number of cups that can be ran in a batch is 98). To program remaining sectors, F2 Program Batch is deployed again. • Panel "12" is preprogrammed for CHOL/GLU/TG and "HDLD" is manually "Selected" from the screen menu. Once the correct chemistries are selected, they are "ENTERed" to bring about "SAMPLE TYPE", wherein "2" is given to denote plasma (not serum). • Function key F8 is used to set up the programmed batches and to advance to the next cup/sample (from cup #1 up to cup #7) in a given sector. By selecting F8 ID numbers can be recorded and reviewed against an Excel reference sheet. • Once a sector is finished running, the results are automatically printed, removed from the printer, and then labeled accordingly. Otherwise, the printed paper is checked and guarded from rolling back into the printer and disrupting the data recording. • Used Eppendorf tubes, pipette tips, sector cups, and reagent cartridges are discarded into biohazard waste containers, and any spilled liquids are cleaned. The average of the diluent analyzer value is subtracted from the analyzer value multiplied by two (dilution factor) to obtain the HDL (indirect) values. Purpose: To obtain lung function profiles for C57BL/6J-Chr#A/NaJ consomic strains using the non-invasive whole body plethysmograph (WBP). Each whole body plethysmograph (WBP) chamber is connected to a bias flow regulator to supply a smooth, constant flow of fresh air during testing. A transducer attached to each chamber detects pressure changes that occur as the animal breathes. Pressure signals are amplified by a MAX II Strain Gauge preamplifier and analyzed by the Biosystem XA software supplied with the system (BUXCO Electronics, Inc.). Pressure changes within each chamber are calibrated prior to testing by injecting exactly 1 mL of air through the injection port and adjusting the computer signal accordingly. Protective equipment (mask and gloves) is always worn when handling powdered methacholine. Used and contaminated gloves are inverted and disposed in biohazard bags. Note: Methacholine is potentially hazardous if inhaled so proper precautions are implemented whenever the pure powder is used. In case of accidental exposure, a bronchial inhaler and an autoinjector of epinephrine (EpiPen) must be readily available. Pure powdered methacholine is stored in the freezer, with desiccant. Stock solutions of methacholine are prepared only in a hood. To minimize repeated exposure, 200 mg ± 40 mg of methacholine is aliquoted in 30 or more tubes (10 mL Fisher tubes with caps) at a time under a hood. To make solution A (20 mg/mL): In an aliquot of 200mg Methacholine, 10mL of 0.9 % Sodium Chloride solution is added. To make solution B (10 mg/mL): Solution A is diluted 1:1 with 0.9% Sodium Chloride solution. To make solution C (5 mg/mL): Solution B is diluted 1:1 with 0.9% Sodium Chloride solution. Mice are allowed to acclimatize for 15-20 min after being placed in the test apparatus. 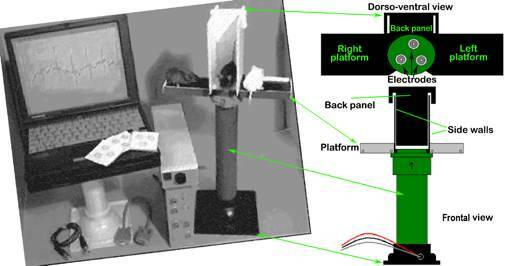 Whole body plethysmograph (WBP) permits mice to move freely within the chambers while lung function is assessed. Twelve mice/chamber are tested simultaneously per session. a. Before use the whole body plethysmograph system is calibrated according to manufacturer's recommendations. 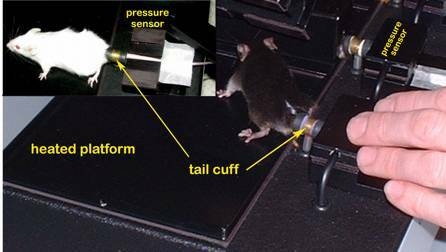 b.Following standard calibration, mice are placed within the chambers of a Buxco full body plethysmograph, and then allowed to acclimate for 20 min. c. During the acclimation period, the system is checked and fixed for any gas/air leaks within all twelve chambers. d. When all systems are leak free, lung function tests are initiated in the presence of room air following manufacturer's instructions. e. Testing is conducted by letting the animals move and breathe freely for 15 min while the following parameters are measured: Tidal Volume (TV), Respiratory Rate or Breath Frequency Response (RR), Peak Inspiratory Height (PIF), Peak Expiratory Height (PEF), Expiratory Time (Te), and Time to expire 65% of the lung "volume" (Rt). f. Raw data for each of the parameters listed above are captured in the software database and averaged once per minute to give a total of 15 data points per parameter (except for Accumulated Volume—see below). g. The average of the 15 data points is reported. Accumulated Volume (mL) is a cumulative value (not averaged) and represents the sum of all tidal volumes for the 15 min test session. h. The protocol is customized to include measurements before, during, and after room air and saline controls as well as methacholine challenge at various concentrations (5, 10, and 20mg/kg) to determine. i. After each measurement session, data are saved on a disk, and the chambers are thoroughly cleaned and prepared for the next batch of mice to be tested. Purpose: To generate blood pressure and pulse phenotypic profiles for C57BL/6J-Chr#A/NaJ consomic strains using the using the Visitech BP-2000 system. 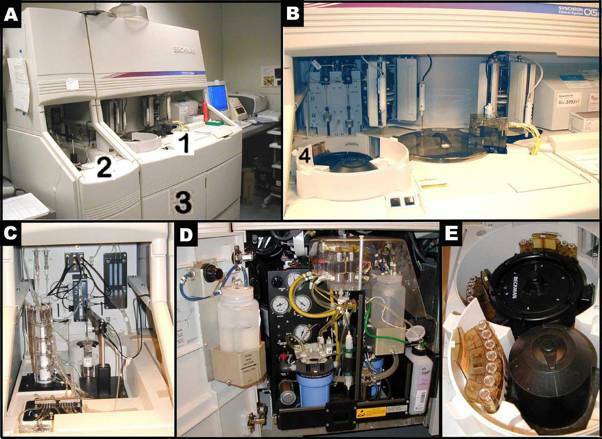 Equipment and Instrumentation: Visitech BP-2000, Cary, NC. Mice are acclimated and trained to test conditions for 5 days prior to obtaining recorded measurements. Measurements of systolic blood pressure and pulse rate are obtained from unanesthetized 10 wk-old mice with minimal restraint using the Visitech BP-2000 system. The Visitech BP-2000 system is a non-invasive blood pressure and pulse analyzer that can accommodate 4 mice simultaneously per session. In order to obtain consistency in the results, mice are first conditioned in the system the same time everyday for at least 5 days prior to an additional 5 days of recorded measurements. Figure 1. The Visitech System for blood pressure and pulse measurements in mice. Figure 2. 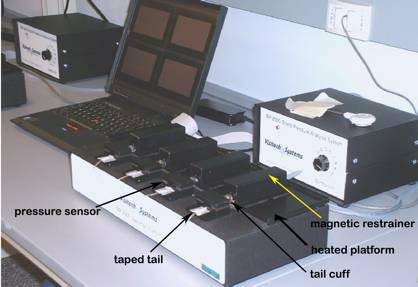 Mice positioned for blood pressure measurement using tail-cuff method. h. In order to obtain reliable and accurate representation of blood pressure and pulse rate, measurements are taken the same way and at the same time for 5 consecutive days. Furthermore, to circumvent inherent system-channel idiosyncrasies or variations, the mice are rotated through all 4 stages and in all available machines. i. After all the data are collected and saved, the bandage tapes are gently removed from the tail so that mice are able to come out on their own off their restraints to be returned to their respective cages. The whole process is executed with the least amount of stress to the mice, while providing them an opportunity to calm down as well. Purpose: To generate Electrocardiographic (ECG) profiles in conscious C57BL/6J-Chr#A/NaJ consomic strains using the using the AnonyMouse ECG screening system. AnonyMOUSE ECG Screening System, for non-invasively recording electrocardiograms in conscious mice (Mouse Specifics, Inc. 28 State St., Suite 1112, Boston, MA 02109) Additional product information here and also here. Figure 3. 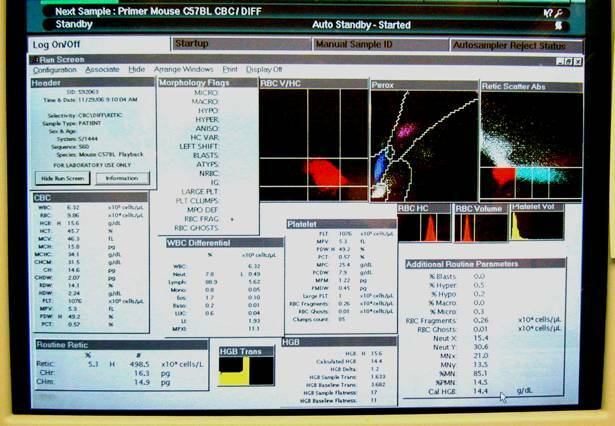 The AnonyMOUSE ECG Screening System for non-invasive measurement of ECG in the mouse. a. Mice are gently removed from their cages, picked up by their tails, and propped on the ECG platform with the least amount of provoked anxiety and stress and then allowed to acclimate for 10 min. d. The output from the amplifier is scrutinized carefully such that only data from a continuous display of 20-30 ECG signals or waveforms (in 2-3s) are recorded and used in the analyses. b. Heart rate variability is calculated as the average of the differences between a given series of heart rates from a set of ECG signals or waveforms. 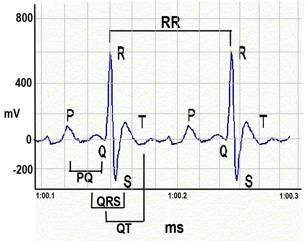 c. QRS complex is automatically determined from the beginning of a Q-wave peak to the end of the S-wave peak. d. QT interval is defined as the segment in ECG waveform beginning at the peak of the Q-wave, including the inverted and/or biphasic portions of the T-wave, and ending at the peak of the T-wave. e. The end of the T-wave of each ECG waveform is defined as the point where the T-wave returns to baseline or isoelectric line. f. Isoelectric line or baseline is defined as the average voltage between the preceding P-wave and the QRS interval. g. The QT intervals are rate corrected (QTc) by application of the equation recommended by Mitchell et al. for use in mice. Electrocardiographic (ECG) waveforms, ECG waveform intervals, and heart rates.